A big Babyology congratulations to Freya Blackwood who has won awards in three separate categories for her illustrative talents. 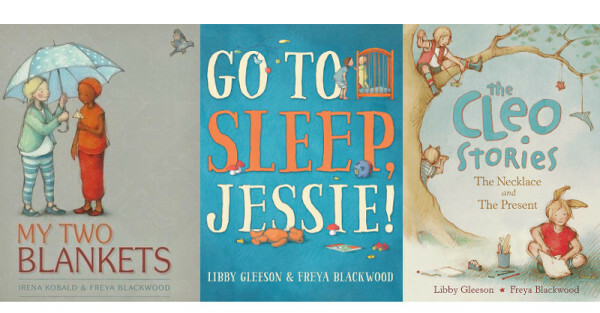 Come take a look at the winning books and find out how you can have a gorgeous Freya Blackwood print hanging in your nursery! When the winners of the Children’s Book Council Awards were announced this year, one name kept popping up – Freya Blackwood. No surprises then that we’ve had our eye on this talented illustrator, writing about her work in Harry & Hopper and The Treasure Box. We love celebrating the achievements of local Babyology favourites. 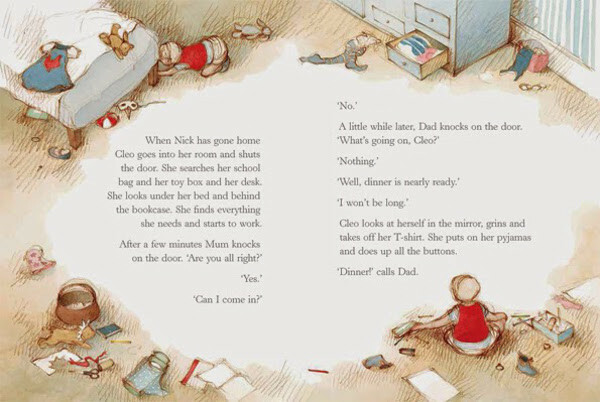 Freya’s work in Go To Sleep, Jessie! 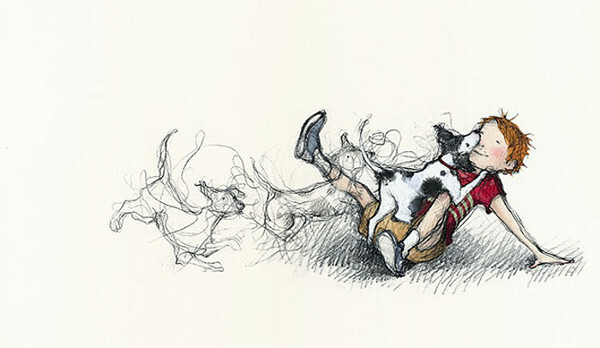 by Libby Gleeson won in the Early Childhood category. 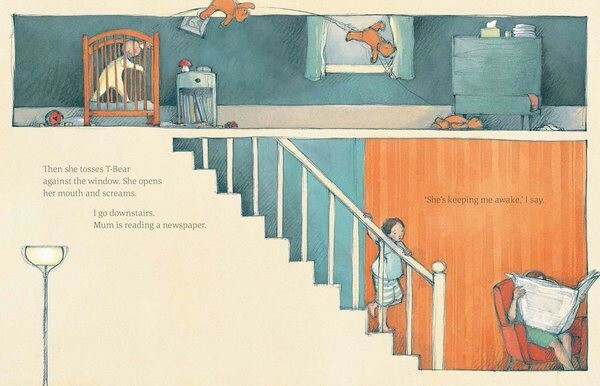 She won in the Younger Readers category for The Cleo Stories, also by Libby Gleeson, and is winner of Best Picture Book for My Two Blankets by Irena Kobald. What a line up! Go To Sleep, Jessie! is a familiar tale of siblings sharing a room when one of them just won’t sleep. Freya builds a world where all things are separated into the calm sleepy hues of blue and the vibrant, awake world of orange. Mum and Dad watch television downstairs in an orange glow, the active baby Jessie’s cot is orange, while her poor sleepy sibling is seeped in blues. It’s a simple contrast of colour that says so much about the mood of the tale without using words. The Cleo Stories: The Necklace and the Present features a crafty kid who loves to create. Teddy bears with paper manes, or batwings taped on, bunny ears on headbands and more litter Cleo’s room. This book beautifully showcases Freya’s talent for really bringing the world of children to life. Each little detail is considered and lovingly constructed. The soft colours give the pictures a nostalgic air as if we are simultaneously viewing our own childhood and those of the characters all happening at once. 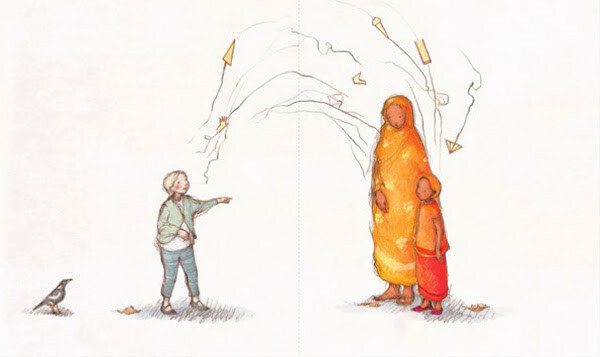 My Two Blankets is an outstanding book that deals with the barriers of language that come with moving to a new country. What a challenge for an illustrator to draw the concept of spoken language! Freya has accomplished this with a clever use of symbols and squiggles. Her mix of colourful, strange background characters also help to create the sensation of being out of sorts with the surroundings. This is more than a book, it is a treasure. Freya Blackwood is bursting with talent and we just love her. If you enjoy her work too, you’ll be interested to know that she also sells a selection of gorgeous prints via Etsy that will add delight to any nursery. These make for a wonderful baby shower gift too.